“Where do you live?” The man selling tickets asked me. “It’s just where you live that matters,” he said, ticking the box for United States. I felt crushed: I’m not Scottish enough anymore? 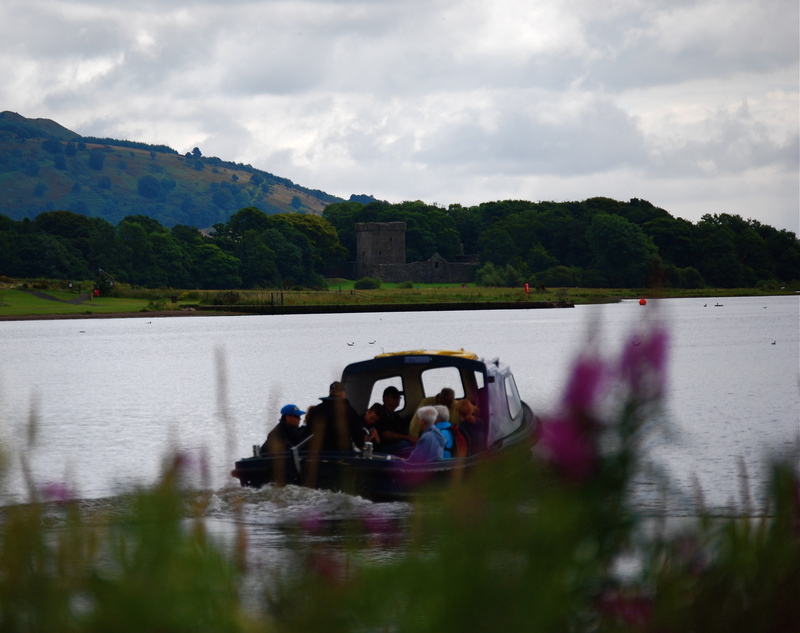 I went outside to wait for the boat to take me over to Loch Leven Castle. A small boat cruised up to the jetty and the ticket seller came running out of the office to make sure I didn’t get on it. I watched as one of the lads standing on the jetty jumped into the lawnmower and drove it on to the tiny boat. It shuddered and looked close to capsizing before getting the thumbs up from the rest of the lads and taking off across the glass-like loch. My boat came along after, with a cheerful, rosy-cheeked skipper. I boarded carefully and edged up against a group of kids. The boat slipped along the surface of the loch; the reflection of the mountains in sharp focus along the water. It took only a couple of minutes to get from the mainland to the castle, which used to almost entirely take up the island, but Mary, Queen of Scots didn’t have it so easy. Mary was imprisoned in the castle for 11 months from 1567-68, during which time she was forced to abdicate her throne to her infant son and miscarried twins she had conceived with the Earl of Bothwell. She only managed to escape by so charming the teenage relative of her gaoler that he stole the keys and found her a boat to row her over to the mainland, locking the gate behind him and tossing the keys into the loch—they were found hundreds of years later. There’s not much left of the castle now, a ruined tower that you can climb up; a few dark cellars that I was too nervous to go down into, and a couple of signposted piles of rubble pointing out various rooms. Aside from the buzz of the lawnmower, safely arrived at its destination, the tiny island was silent, allowing my thoughts to settle on Mary, our tragic Queen. Her escape wasn’t the end: she was to spend 19 years in custody in various English castles, before being executed in 1587. There’s not a whole lot to do at Loch Leven Castle, besides thinking about Mary and gazing out across the loch as she herself must have done, hoping for a better future. I strolled up to the jetty and waited for another boat to take me back. I was on my own in this one…apart from the ghosts.